32" Pro Series outdoor digital signage by SunBriteDS. Commercial-grade, rugged and engineered for permanent outdoor placement. 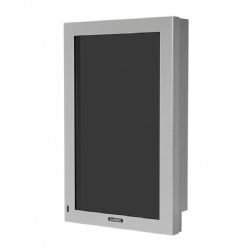 The DS-3214P - configured in hard-to-find portrait-mode - features Enhanced Solar Tolerance technology for direct-sun applications ... allowing the unit to display signage or video while placed under direct sunlight. This 32" outdoor digital signage powerhouse includes an Ultra Bright 32-inch full HD 1080p LED-LCD screen for improved outdoor viewing and anti-reflective protective glass to shield the screen. Need sound? The DS-3214P does not include its speaker. Purchase the all-weather SB-SP47P 20 WATT detachable speaker module, available on this website. The DS-3214P - "P" for portrait mode - and "perfect" for high-traffic outdoor venues such as sports stadiums, resorts, cafes, outdoor theaters, beach-scenes. Designed to withstand rain, snow, salt-air, humidity, pool splashes and just about anything Mom nature can throw at it. Exterior designed to protect internal components from rain, snow, dust, in and salt air. Powder-coated rust-proof aluminum exterior for strength and durability. Multi-fan airflow system keeps the unit cool and dry in temperatures up to 122 degrees F.
Front tempered anti-reflective glass window provides added protection to and safeguards against vandalism and abuse. RS232 serial control with discrete on, off, and input control. Rear IR receiver (located in the cable-entry compartment).